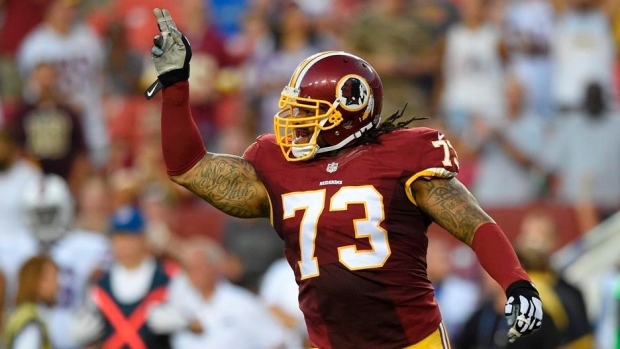 There’s one player who won’t take the field when the Washington Redskins face the Dallas Cowboys on Oct. 21. According to a statement from his agent, defensive lineman Evander “Ziggy” Hood has been notified of his release from the team. Hood, a natural end, played nose tackle the previous two years because of injuries to others. Washington re-signed him in the offseason to a one-year deal worth up to $1.78 million, and his $1.2 million base salary was guaranteed when he made the roster out of camp. He was on the bubble during training camp and might have been cut at that time had Stacy McGee been available. McGee, however, remains on the physically unable to perform list after undergoing core muscle surgery in the spring. He’s eligible to start practicing, but it’s uncertain when he will be on the field again. After delivering 27 starts in his first two years with the club, he has no starts in 2018 and his production has fallen off in the process. The veteran has only 1.5 sacks and one forced fumble since landing in Washington, neither of which have come in any of the first five games to start this year. He’s been blanked across his stat line, mostly, save for his lowly three combined tackles. A former first-round pick of the Pittsburgh Steelers in 2009, there were many who felt Hood had a ton of upside after coming on strong at the University of Missouri. He’d go on to spend his entire rookie contract, including a fifth-year option, in Pittsburgh before becoming an NFL journeyman. Prior to joining the Redskins, he had stints with the Jacksonville Jaguars and Chicago Bears, with neither lasting long at all. He’ll now head to free agency having 222 total career tackles, 14 sacks, 10 pass deflections, five fumble recoveries and the aforementioned forced fumble on his resume — in the hopes a needy team will contact him for his services.